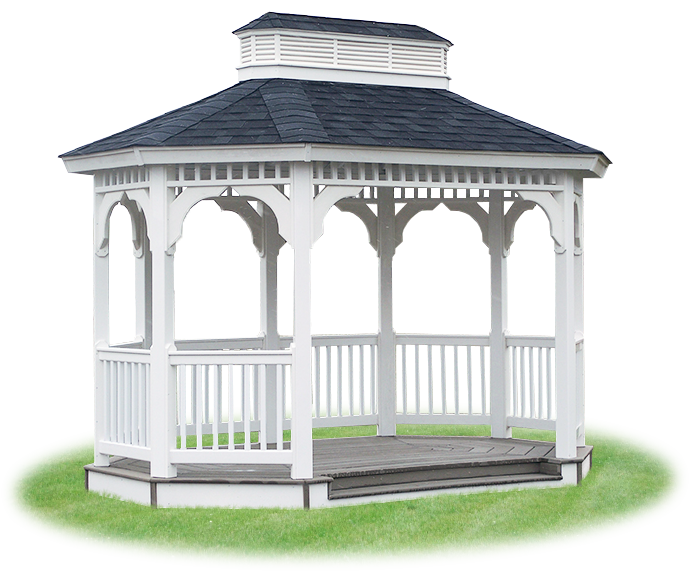 Vinyl gazebo shown with shingle roof, queen anne braces, straight picket railing, benches, and composite decking. 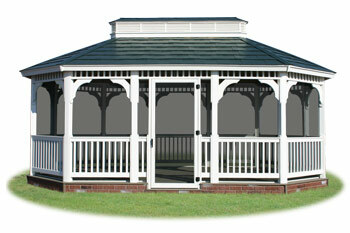 Vinyl gazebo shown with shingle roof, traditional braces, straight picket railing, and composite decking. 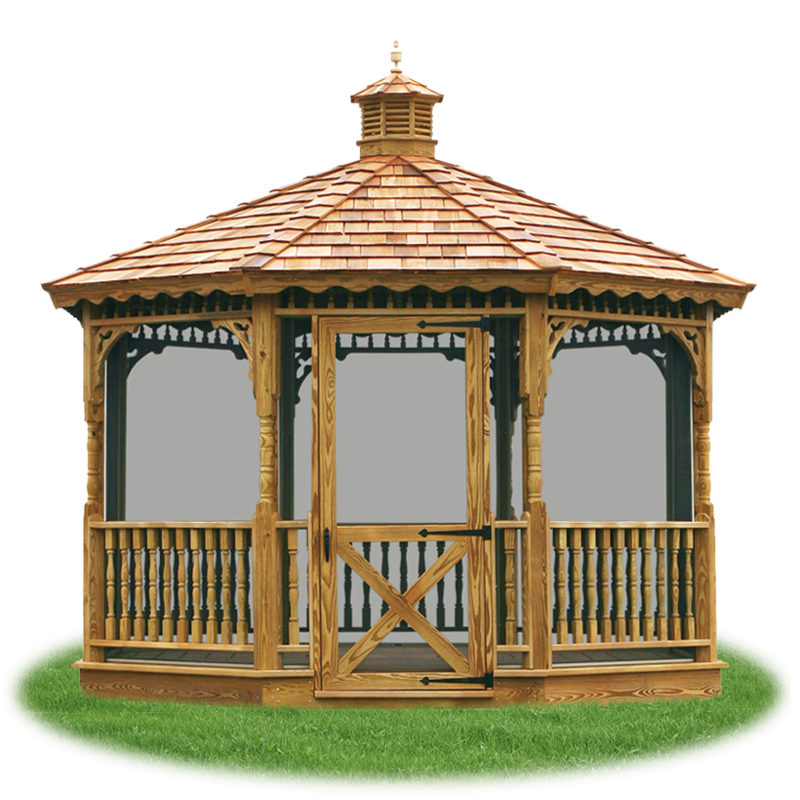 Wood gazebo shown with cedar shake roof, scalloped faceboards, queen anne braces, turned posts, traditional spindle railing, and pressure treated 2x6 floor. 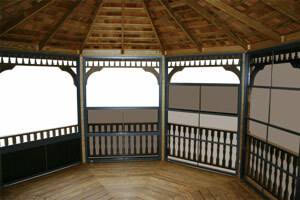 Enclosed with screens and wooden screen door. 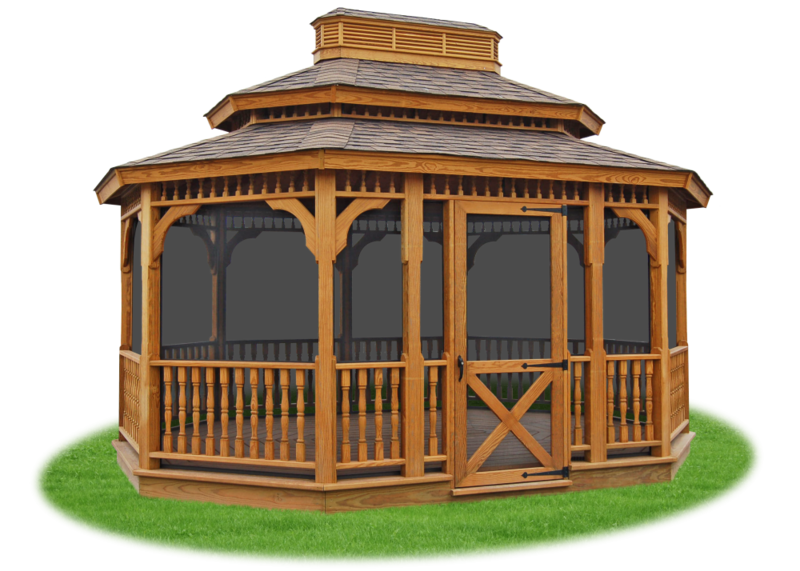 Wood gazebo shown with cedar shake roof, scalloped faceboards, traditional posts, classic spindle railing, and pressure treated 2x6 floor. 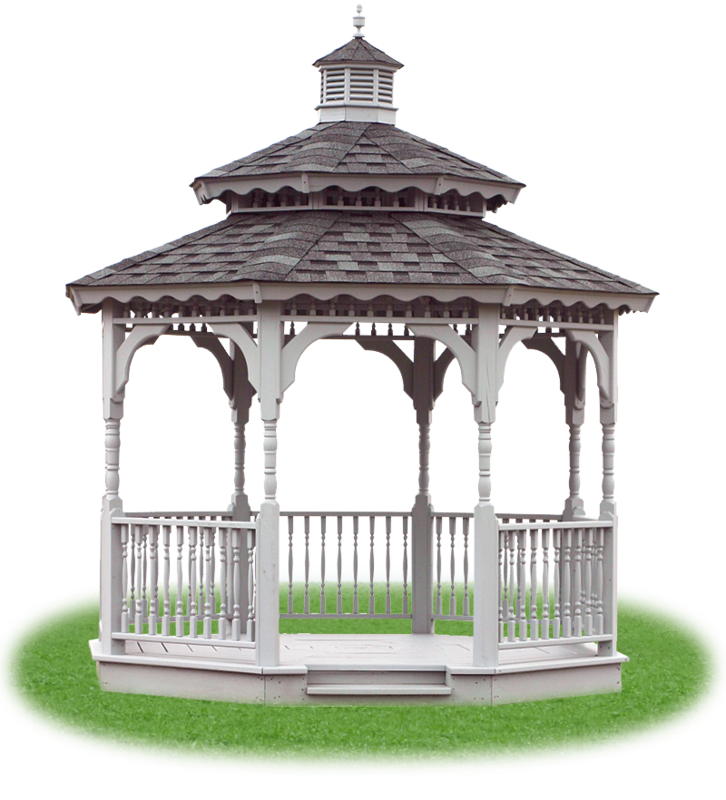 Painted Wood gazebo shown with shingle roof, traditional braces, turned posts, classic spindle railing, and pressure treated 2x6 floor. 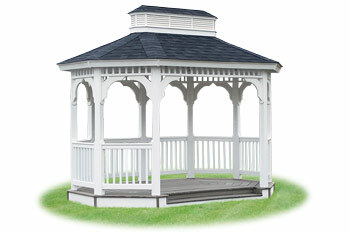 Vinyl gazebo shown with shingle roof, traditional braces, turned spindle railing, and composite decking. 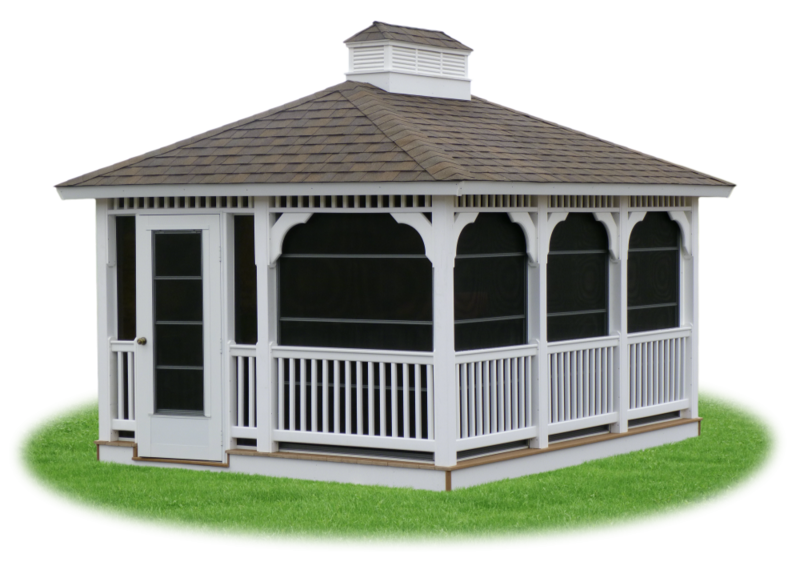 Enclosed with screens and screen door. 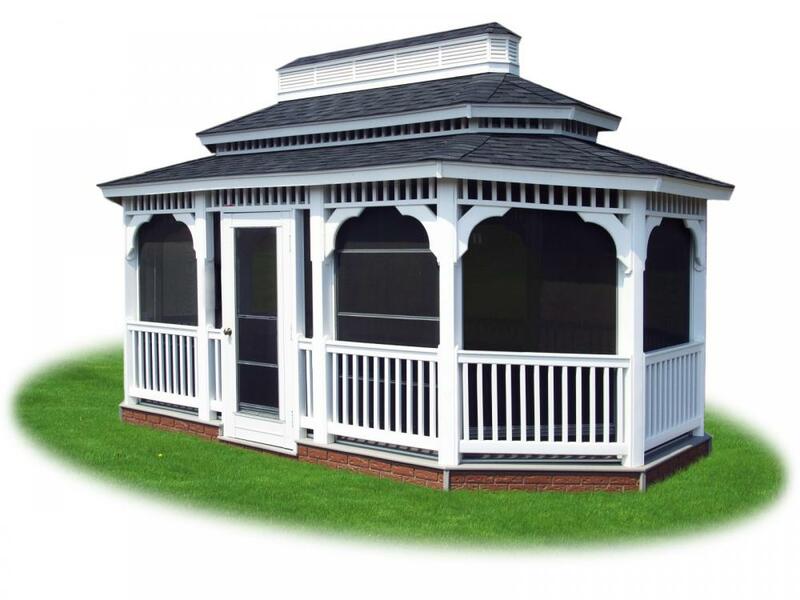 Vinyl gazebo shown with custom roof, traditional braces, straight picket railing, composite decking, and brick bottom detail. 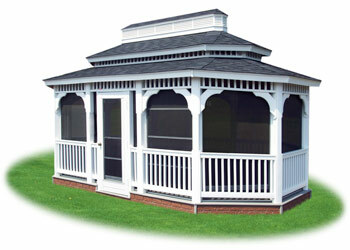 Enclosed with screens and screen door. 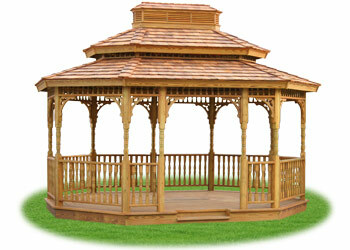 Wood gazebo shown with cedar shake roof, traditional faceboards, traditional spindle railing, pressure treated 2x6 floor. 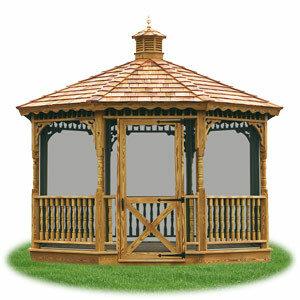 Enclosed with screens and heavy duty door with Easy Breeze sliding panels. 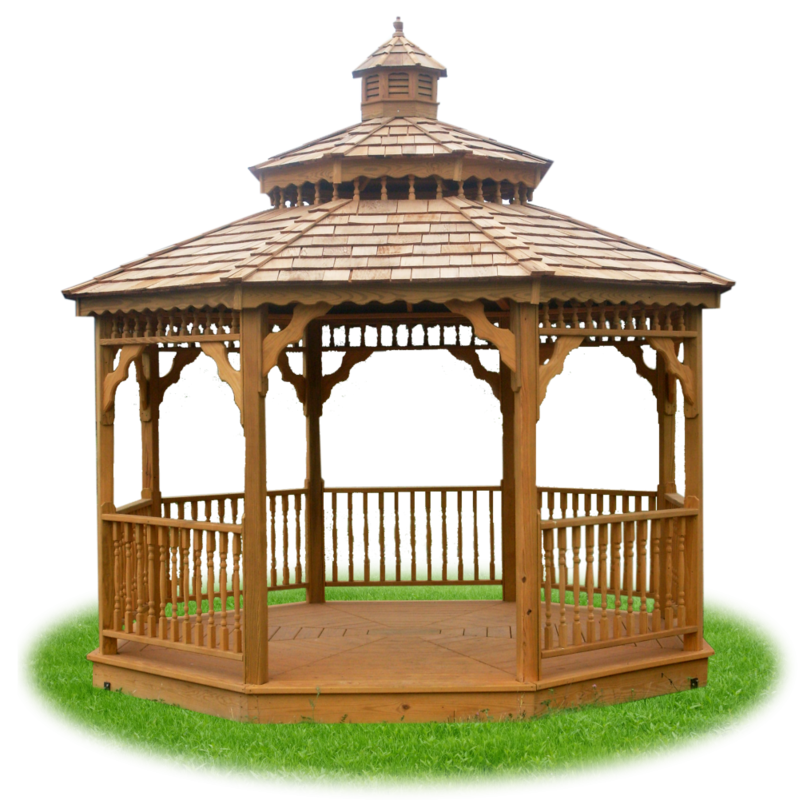 Wood gazebo shown with shingle roof, traditional faceboards, traditional braces, traditional spindle railing, and pressure treated 2x6 floor. 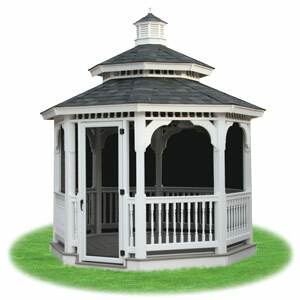 Enclosed with screens and wooden screen door. 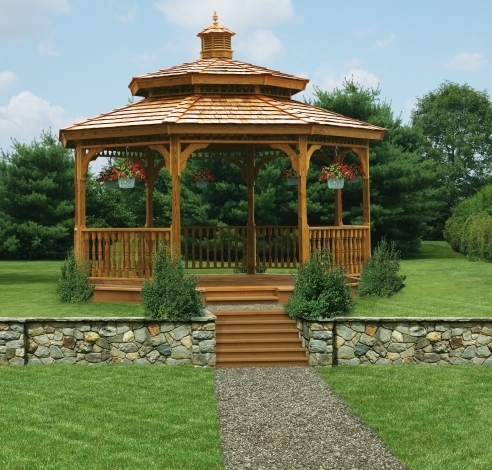 Wood gazebo shown with cedar shake roof, traditional faceboards, queen anne braces, turned posts, traditional spindle railing, and pressure treated 2x6 floor. 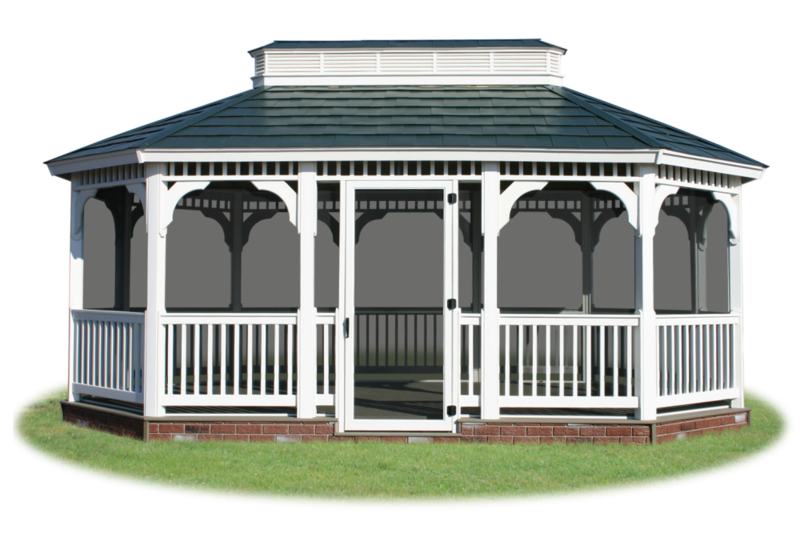 Vinyl gazebo shown with shingle roof, traditional braces, straight picket railing, composite decking, and brick bottom detail. 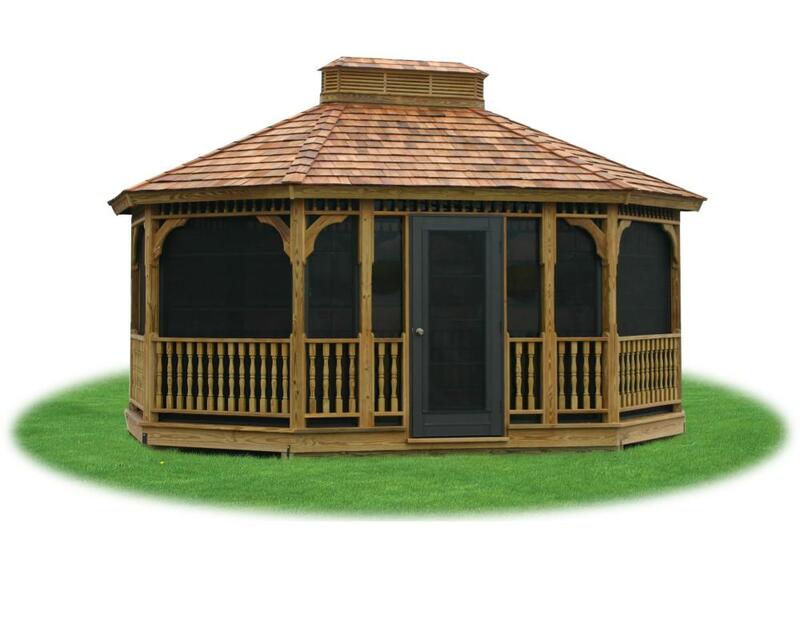 Enclosed with screens and heavy duty door with Easy Breeze sliding panels. 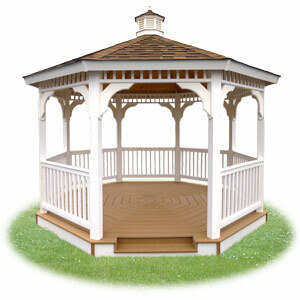 Wood gazebo shown with cedar shake roof, scalloped faceboards, queen anne braces, turned posts, traditional spindle railing, and pressure treated 2x6 floor. 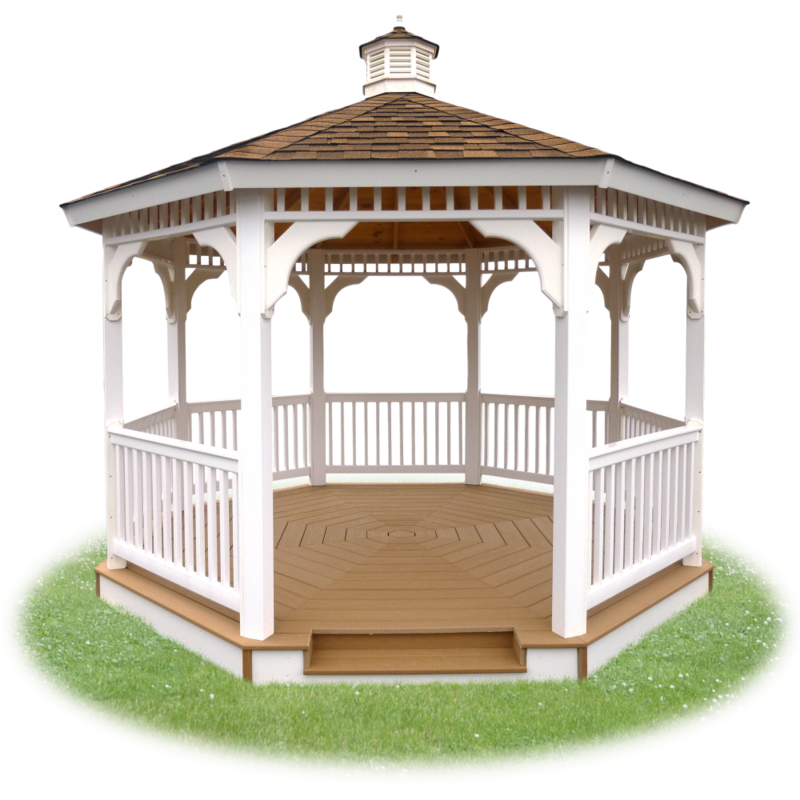 Vinyl gazebo shown with ivory vinyl, shingle roof, traditional braces, straight picket railing, composite decking, and brick bottom detail. 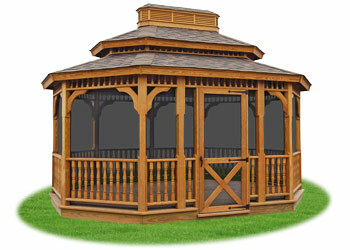 Enclosed with screens and heavy duty door with Easy Breeze sliding panels. 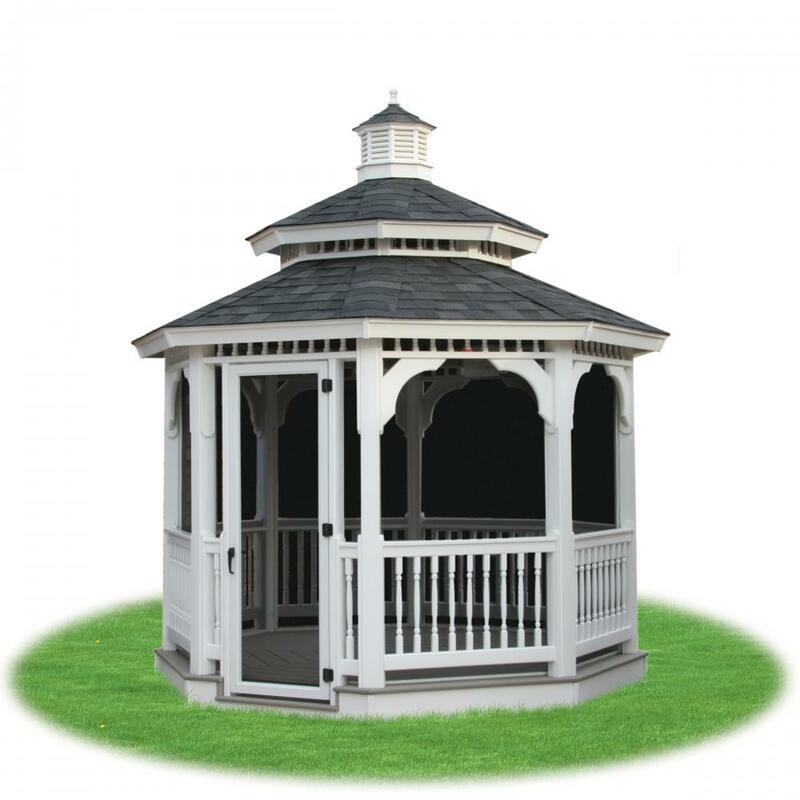 Vinyl gazebo shown with shingle roof with cupola, traditional braces, straight picket railing, and composite decking. 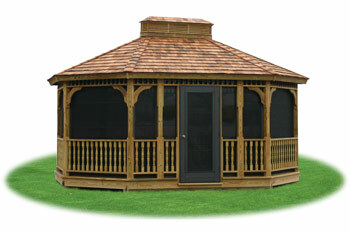 Enclosed with screens and heavy duty door with Easy Breeze sliding panels. 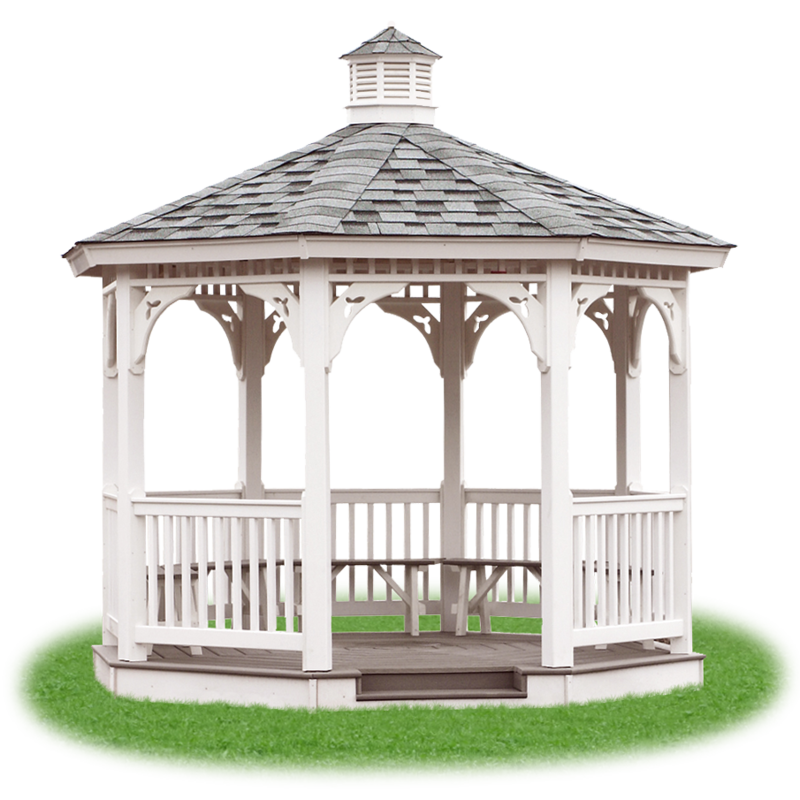 Why Choose a Vinyl Gazebo? 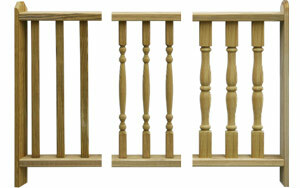 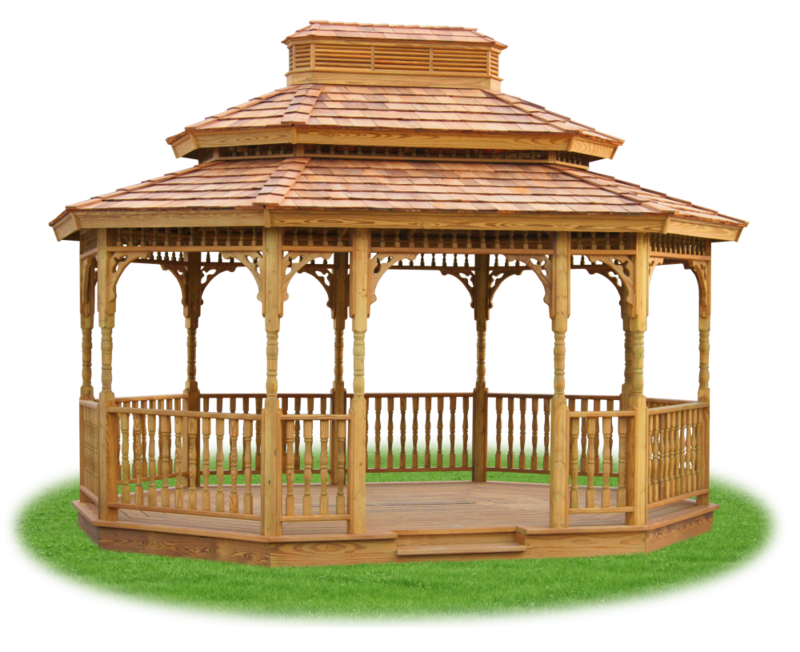 Why Choose a Wood Gazebo? 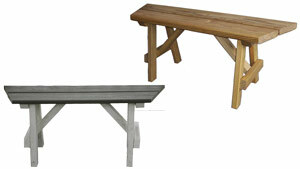 Some options may come at an additional cost. 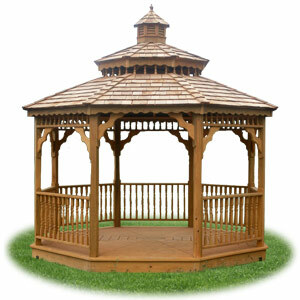 your vinyl or wood gazebo. 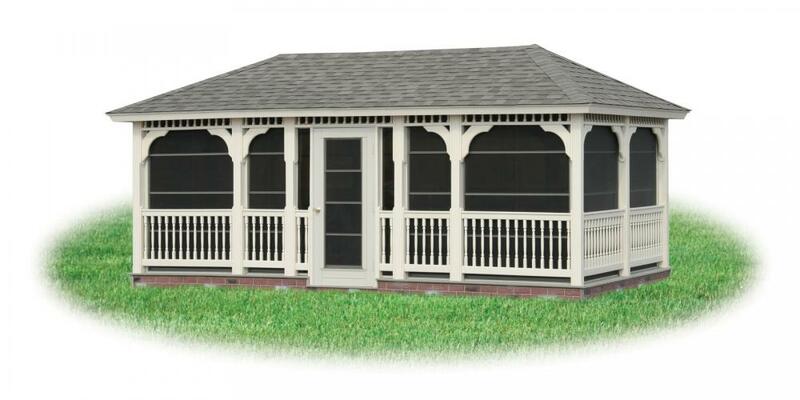 Complete your outdoor oasis by adding screens and a screen door... Let the breeze in and keep the bugs OUT! 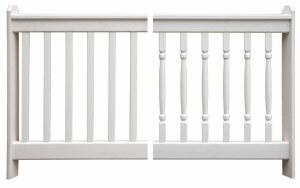 Screens are held in place with an easy to remove strip... that means it's easy to remove a screen to bring in a big item that doesn't fit through the door. 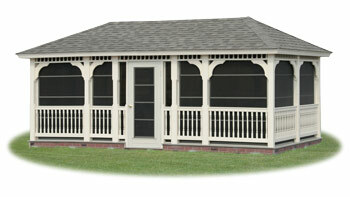 Screen doors are aluminum frame with fiberglass screen. 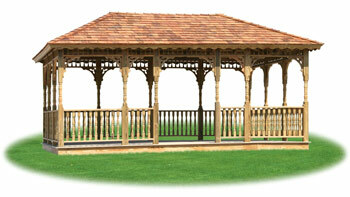 Extend your outdoor season and help keep the elements out by adding our Eze-Breeze sliding panels. 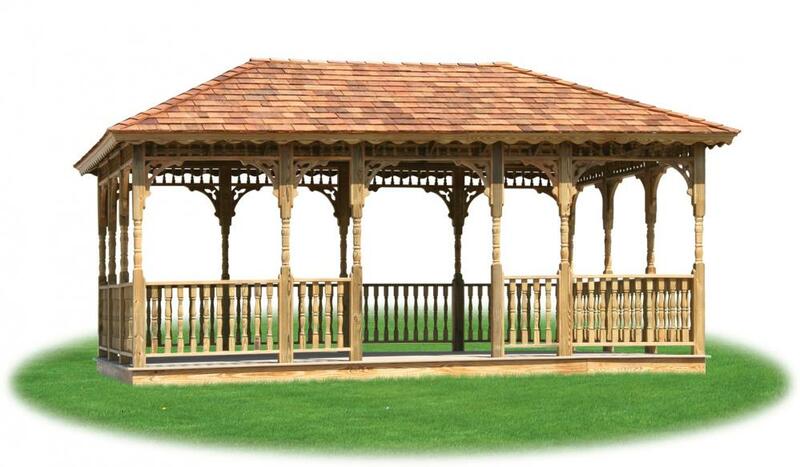 The lightweight glazed panels can be raised or lowered effortlessly to open up one-quarter, half, or three-quarters of the window area to the breeze. 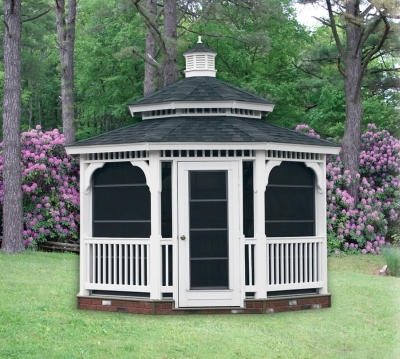 A heavy duty aluminum door also contains Eze-Breeze panels. 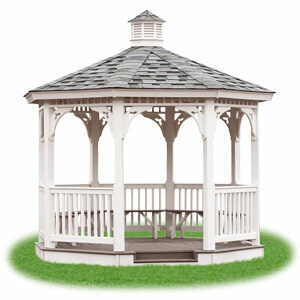 Instantly turn your gazebo into a three-season outdoor room. 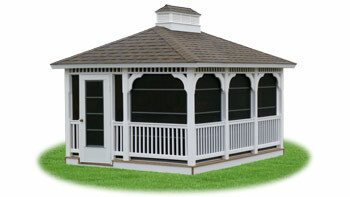 Other options available including metal roof, cedar shake roof, ivory vinyl, and electrical packages. 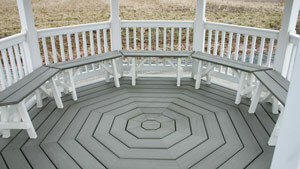 Choose from a variety of colors for composite decking, shingles, and wood stains. 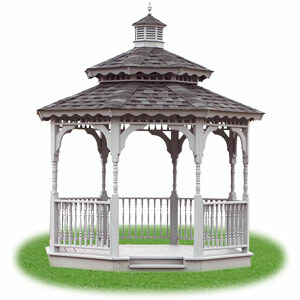 Talk to your local sales manager to customize a gazebo to YOUR specifications, see color options, and get a free quote!